A light vegetable salad. 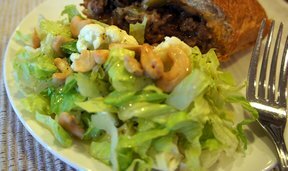 Any vinaigrette dressing of your choosing can be used. In a small bowl, combine dressing ingredients and set aside. Bring a large sauce pan with 2 to 3 quarts of water and 1 to 2 teaspoons of salt to a full boil. 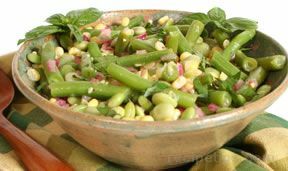 Add cut green beans and cook 1 minute. Add corn, lima beans, and pimentos. Continue to cook 5 to 6 minutes or until just tender crisp. Drain and rinse with cold water until cool. 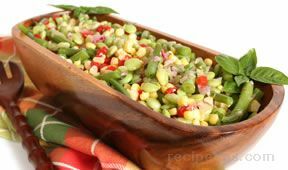 In a serving bowl, combine bean mixture with dressing. Toss and garnish with chopped fresh basil. Season to taste.